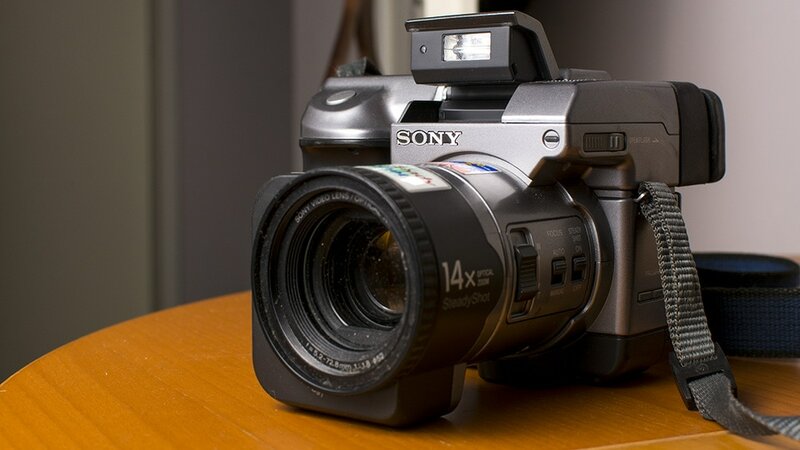 A little bit on the first digital camera I used, a Sony FD91, all the way back in 1999. Yes, it was early 1999 when my father first went looking for a digital photo camera. He needed one for a university project. He went to the shop, and asked for the advanced camera they had. It was the Sony FD 91. This was a camera, released in December 1998, was loaded with features, and for those traditional photography enthusiasts out there looking for 'full manual control', this camera got pretty close. Manual aperture and shutter priority is something you don't see in cheap digital cameras nowadays, along with full manual focus, spot metering, manual white balance and a quite unbelievable 14 x zoom. Yes, that is a 37-518mm equivalent lens. Taking pictures with the huge zoom was made possible by integrating it with "steady shot", a feature from Sony's video camera range. The best feature was that you could use floppy discs with it, making it one of the few cameras with easily and widely available storage devices. You could store about 20 pictures on a single 3,5" disc. When I went outside with the cam, I usually took a stack of 10 discs with me. The camera gave me two years of shooting pleasure, and sparked my interest in photography. However, the horrible low-light performance of the camera, coupled with tiny resolution (only 1.6mp) and very high image compression finally made me buy a new camera in 2001.